"What the helll is that?" A taloned-claw pointed at the holovid screen, its owners incredulous voice almost warbling. "Uh, thats the Giant Claw." Peter Kirks own voice was quavering in embarrassment. A few of the crew (including Fleet Captain Chekov who was suddenly slinking lower in his chair to avoid being noticed) had gathered in one of the Enterprise-B's rec decks to watch some really old science fiction movies, some dating back more than three hundred years. Many of them had been laughing softly at the ludicrous monster on the screen when the Enterprises chief of security had walked in. "Its offensive! Its lllike some sort of caricature of what a true bird-of-prey shoullld be." The seven and a half-foot tall, winged, golden feathered Skorr was outraged. "Yes, Chterr, it is indeed offensive." There were a few more laughs, whether at the film or Kirks response, Chterr was unable to determine. "Is it supposed to be frightening? Or menacing, somehow? Or is it a comedy?" "Well, it was supposed to be a scary movie. It just didnt turn out the way the producers and stars imagined it would. During its premiere, the theater audience laughed every time it appeared on-screen, and its stars slunk away before the movie ended." "As wellll they shoullld. Obviousllly, it was intended to be a parody. If this were produced today, I should think that the Skorr Embassy would be charging its producers with racism, or at the very least, bad taste!" "It was definitely meant to be a horror flick. It just ended up being horrible instead." He gestured to the screen. "The actors had no idea of how the monster was going to be visualized. When they saw it for the first time at the movies premiere, they were deeply embarrassed." "As they shoullld be." Chterr helped himself to some of Ensign Walt Andrews popcorn. "Here I was coming to join you for your movie night, and Im subjected to some sort of unintentionallly humorous, lllatentllly racist filllm." "This ones almost over, Chief. I think the next one will be right up your alley. 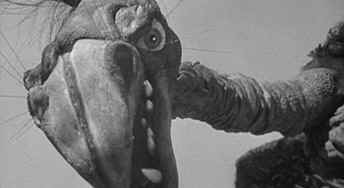 The protagonists are a pair of giant pteranodons who have hatched in the middle of the 20th century. Its a tragedy and a love story as well, as one of them chooses to join its injured mate in a fiery end." "It sounds intriguing. Whats it calllled?"